For those of you who haven't heard - we got married 2 weeks ago in Auckland. 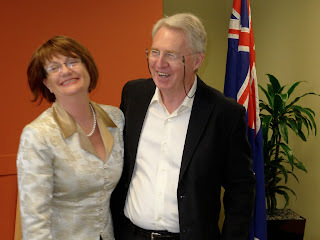 It was terribly romantic - Kate needed a visa and Lawrence has the all important British passport... Australian bureaucracy is such that it was much easier to fly to Auckland to get married in the registry office by a 12 yr old Chinese dude in a pullover. The bride's bouquet was a Moet & Chandon ice bucket, very apt, supplied by Joint Chief Bridesmaid, Jenny Vickers. House is packed up, we leave tomorrow!!! Congratulations, starry eyed newly weds! Getting married on a whim and roaming around Eurasia in a transformer...you two are more 22 years old than I am. Best wishes from Austin, Texas. watch the turtles mating? my mom is so weird.